We will start by finishing the top of the Pocket, using the pressing with templates method. Lay your Pocket piece wrong side up. Place the 1 ½″ by 11 ½″ template on the pocket and fold over the top until the raw edge meets the bottom of the template. Press. It may be easier to turn the pocket upside down and press the fabric towards the top of the template away from you. You are more apt to get a more precise folded edge. Flip them hem to the right side of the Pocket. Stitch the end seams and trim the seam allowances. I chose to add a strip of Fusi-Web to the inside of the pocket hem, to be pressed in place later, to help secure the knit while I was topstitching. To do so, cut a length of Fusi-Web and press it along the edge of the hem. However, leave the paper on, you will remove it and secure during a later step. Press the seams open over a point presser. The corners will look sharper. ​Turn the Pocket to the right side, enveloping the raw edges. Then, place the Pocket Template on the wrong side of the Pocket, inserting it under the hem. Press the remaining seam allowance up and over the template edge. When you are finished pressing, trim the seams. ​After I had the edges pressed, I pulled off the paper from the Fusi-Web on the inside of the top pocket hem and pressed it to secure the hem. This is especially helpful when working with a knit and made it easier to topstitch. Now, it is time to place the Pocket on the coat front, matching the upper corners to the dots. While my sewing machine had no trouble stitching this knit in any other step, I did have trouble with the Pocket. The knit wanted to shift and stretch while I stitched and the layers of the thicker knit led to skipped stitches. In the end, I secured the pocket the old-fashioned way, with basting stitches and pins. It didn't look pretty, but it kept the pocket anchored while I stitched. If you have a similar problem with your fabric, you can also try securing the pocket with Fusi-Web or Sewing and Craft Tape. To help my machine stitch through the thicker fabric, I switched to a walking foot. I also added a layer of tissue under the pocket to help the fabric feed smoothly through the machine. 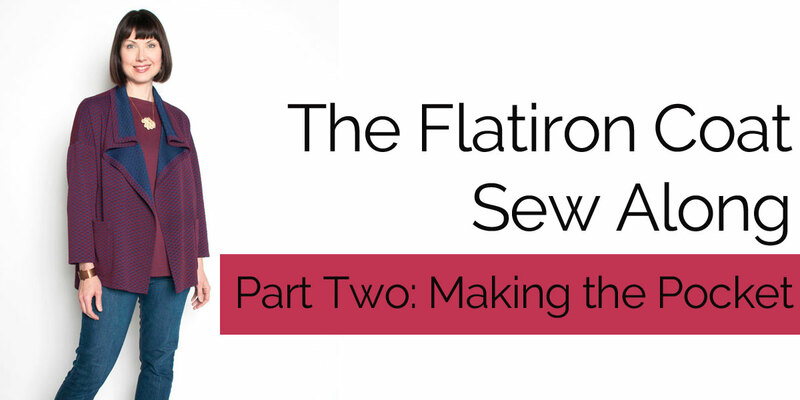 Join us for Part Three of the Flatiron Sew Along where we will join the Front and Back and add a Back Facing. 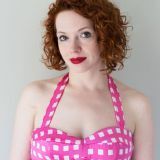 If you are just joining us, be sure to refer back to previous Sew Along post, Part One: Getting Started.